Posted on Mon, Feb 6, 2012 : 8:33 a.m. Lawmakers are in no hurry to take action on sure-to-be controversial measures to fix Michigan’s crumbling roads, the Detroit Free Press reports. The package of bills, of which State Rep. Rick Olson, R-York Township, is a lead sponsor, includes a plan to raise the tax on gasoline and vehicle registration fees. 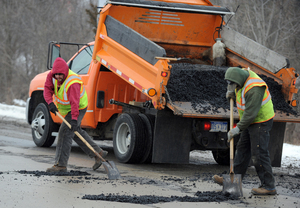 Washtenaw County Road Commission workers apply cold patch to fill potholes in this file photo. A more permanent fix for Michigan's crumbling infrastructure is expensive and unlikely to be popular with voters. "On the increases, the gas tax itself, those kinds of things, we're going to take our time with that," Sen. Tom Casperson, R-Escanaba, chairman of the Senate Transportation Committee, told the Free Press. The bills include a plan to replace the 19-cent tax many motorists now pay at the pump with a 28.3-cent tax at the wholesale level, a 9.3-cent increase. The legislation proposes stabilizing that wholesale tax rate so it cannot rise or fall more than 1 percent per year. Another bill would raise vehicle registration fees by about $60 per car or light truck on average. Wed, Feb 8, 2012 : 2:44 p.m.
A new tax from the Tea party? If you drive to Ohio, you will see that Ohio cares allot more about the weights placed on public roads. Travel even further to states with toll roads and you will find the enforcement is even greater. So why does Michigan keep-up this charade that the guy or gal with the little Ford or Toyota, is destroying the road. Ask any highway engineer about road damage caused by over loaded semi-trucks, and weight limits incompatible with Michigan's roadways. Unless she or he is in the pocket of the "Road Construction Lobby," the undeniable truth will be told. Democrats and Republicans all seem bulk at the thought of limiting weight and increasing fees for trucking. You will get the same response if you demand warranties for road construction. Some will point to higher prices for consumers, but this would quickly fall victim to the rules of competition and the use of Michigan's rails. If we were to reopen the weigh stations for large trucks and start enforcing lighter weight limits for trucking, the outcome would be smooth sailing. Those who drive will have to pay more for this luxury, as the tax dollars wane for the subsidization of roads. If we are truly a free nation we must not put the burden of road taxation on those who chose not to drive. I agree with the Obama administration that Americas infrastructure needs to be revamped, but to rebuild a dinosaur is futile in a world soon to be starved for energy. Even if ever car on the road was electric, it would still need a road to drive on! I'm willing to pay more for the privilege to drive my truck and I don't need those who bike or walk to pay for it. Why are Democrats and Republican in such denial when it comes to putting the cost where it belongs? Tue, Feb 7, 2012 : 5:56 p.m. Here's a reprise of my earlier comments on this issue, using the latest info about a 10.1% gas tax at the wholesale level to replace the current $.19 tax at the consumer level. The net result of this shift for consumers will be artificially increased gas prices that go well beyond the tax itself. This is because when wholesalers are charged with the tax, this becomes a production &quot;cost&quot; on which they will (justifiably) earn a margin of profit through their wholesale pricing. When the gas retailer pays that now-inflated wholesale price and applies a margin of profit, the result is a further artificial escalation of the price of gas to the consumer. The net result is that a tax of $.283 at the wholesale level ends up being much more, a net increase of about $.442 to the consumer, using estimated wholesale and retail profit margins. The price of a gallon of gas has been artificially inflated by $.16 to the consumer, beyond the tax itself. Gas retail priced at $3.49 under today's tax system would end up at $3.74 a gallon or more under the &quot;wholesale tax&quot; system simply because of how the tax was applied. To add insult to injury, the consumer pays 6% sales tax on that extra $.16 per gallon, adding another $.01 of inflated cost to the consumer. To minimize impact on the consumer, yet still raise the needed $ to repair roads and bridges, it's important to leave the point of taxation at the consumer level, as an add-on to the gallon price at the pump. We can raise that tax to whatever we all agree is needed to accomplish the job, without artificially raising the price of gasoline itself. There's no need to hide this tax --and it's unintended inflation of gas prices to the consumer -- at the wholesale level. I support increased taxes to improve our infrastructure. Let's just do it in a way that is transparent and does not penalize us. Tue, Feb 7, 2012 : 3:48 p.m. These taxes obviously have to pay for a whole lot more than people realize. There's a difference between &quot;I already pay taxes&quot; and &quot;I already pay taxes at the level that pays for all of the services that I use.&quot; The roads here are terrible. The best solution appears to me to be a wholesale gas tax that's indexed to inflation. Tue, Feb 7, 2012 : 3:40 p.m.
No more taxes. Gas is high enough as it is, and the cost to get a license renewed is also high enough. The governoring bodies need to be more fiscally responsible as to how they spend the tax payers dollars. Tue, Feb 7, 2012 : 3:36 p.m. This will just end up in another spending account once they have a surplus, take a good look at California, the roads are just a little better for the money they collect. Tue, Feb 7, 2012 : 1:11 p.m.
Great. The state has a surplus &amp; the tax hikes already legislated haven't even kicked in yet. Let's tax Michigan's taxpayers even more to fix our terrible roads that have been neglected by our complacent legislature. What ruins our roads? Trucks. Who owns the trucks? Business owners. Let's give business owners a big tax break &amp; increase taxes on automobile owners to pay for the road damage caused primarily by trucks. More ill-advised &quot;tough decisions&quot; are on the way folks! Brilliant . . .
Tue, Feb 7, 2012 : 6:03 a.m.
Smart idea on behalf of State GOP 'leadership', if I have to say so myself (yes, I have fell off my chair, while typing this). Gas is already high enough. Of course, raising taxes in a election year, is never good either. I'm true their true motive (of dealing with the tax hike later) surrounded this. Michiganders, struggling to pay the ever increasing cost of gas....was the last thing on their minds. Tue, Feb 7, 2012 : 3:42 a.m. I would be more accepting of the increases if our governor had not already hit us hard with increasing taxes, cutting services, disallowing income tax deductions for donations to charities, taxing the pensions of some of the most vulnerable citizens, reducing the length of unemployment benefits, etc., and then giving his corporate cronies $1.8 billion in tax cuts. I thought Republicans were AGAINST raising taxes of any kind. Mon, Feb 6, 2012 : 7:54 p.m.
Of course they're going to wait to take action. That's what our politicians in Lansing have been doing for decades, which has resulted in our roads being in their current appalling condition across the state. Thanks to this mismanagement, our road maintenance has been underfunded for years and it will take a lot more money to get us back to a minimum standard than we could ever find elsewhere in the budget. Sure, it's never fun to have to pay more in taxes, but there isn't any choice left at this point. Mon, Feb 6, 2012 : 7:08 p.m. If they're going to be using the inreased tax dollars to do repairs similar to those in the picture attached to the article then, I'll pass. That patch work job of throwing something in the hole and letting people drive over it, or it getting stuck on your tire or car(I've had this happen before, i got home and a big piece of it was stuck to the tire) isn't worth my extra tax dollars. Rebuild the entire roads from the ground up not resurface it, or take a few lessons from our German counterparts and see how they build there roads because they are MUCH better than ours. Mon, Feb 6, 2012 : 8:50 p.m. There was a man who ran for governor in 1998 who talked about building those types of roads in Michigan; Geoff Fieger. Roads designed to last 40 years instead of 20. Making the roads fit the volume of traffic they were designed to have on them. These are the two main problems Building roads that last 40 years is more expensive in the beginning. Of course politicians who are only elected in 2 to 6 year cycles do not need anything to last 40 years. I will also point out Michigan allows some of the largest size trucks in the nation. This is from a traffic engineer web site: &quot;The rule of thumb among highway engineers is that road deterioration is roughly proportional to vehicle axle weight to the fourth power. In other words, doubling the weight on an axle increases the wear and tear on the roads by 24, or 16 times. Roads are usually designed assuming that a single axle on a big truck carries a maximum of 18,000 pounds. Compared to a typical car carrying 2,000 pounds per axle, a fully loaded truck stresses the road surface 6,561 times as much. Minor overloading can make a big difference. Exceeding the maximum load by just 10 percent increases road stress by 46 percent&quot; The state needs to greatly increase taxes on all trucks and especially large trucks. Gasoline usage does not take that exponential factor into account. Mon, Feb 6, 2012 : 8:02 p.m. The picture above shows &quot;patching&quot;. This is a temporary but effective way to make simple repairs. Yes, it does get into your tires but its the tires that flatten it out too. It does not harm the vehicles. So what you get something stuck in the tires. So do rocks and rocks do alot more harm to a vehicle when hit. Oh but wait should we remove them too? To rebuild the road it would cost a whole lot more then patching. So then the tax dollars and gas taxes would increase alot more and more often if that is what we did for every hole in the ground. Mon, Feb 6, 2012 : 4:54 p.m. Repairing road infrastructure needs to be a top priority. Who wants damage to an automobile undercarriage due to unmaintained road surfaces? Gasoline taxes are an equitable way of allocating tax burdens in this matter. No they are not. A giant truck does exponentially more damage than a Ford Fiesta. There are also trucking companies in Ohio, who can buy gas there, drive on Michigan roads and never get taxed a single dime. Mon, Feb 6, 2012 : 4:14 p.m. I'd rather see a bit more added to the wholesale tax rather than raise the registration fees. This would put the tax where it belongs, with road use rather than on a vehicle that sits around longer than others. Mon, Feb 6, 2012 : 2:32 p.m. It's funny that car drivers think they can get endless miles of perfect roads without having to pay for it. Automobile use is more expensive than anyone imagines, because most of the cost is paid for by the general public through income, property and sales taxes. The more drivers are held responsible for those costs, the better. Only public goods should be subsidized by the public, not public bads. Tue, Feb 7, 2012 : 1:09 p.m.
Tue, Feb 7, 2012 : 1:02 p.m.
Trucks are what ruin roads, not cars. Put the burden on those businesses that beat up our roads with their trucks. Mon, Feb 6, 2012 : 5:25 p.m.
Joe - Taxes on tires, cars, drivers licenses, fuel, and other automotive related items more than covers the cost of fixing the roads. Unfortunately, there was a surplus for a few years so the politicians found other things to do with the money. So, now the money that is collected from drivers is spent on other things and the roads are not maintained. Mon, Feb 6, 2012 : 2:56 p.m.
&quot;It's funny that car drivers think they can get endless miles of perfect roads without having to pay for it. &quot; We HAVE been paying for the roads, plenty. What we want is fiscal responsibility with that money that we have paid. You continue to walk and bike and take the bus around in your own little world. Don't bother to let reality creep in. Mon, Feb 6, 2012 : 1:59 p.m. The tax and spend Republicans getting cold feet? Mon, Feb 6, 2012 : 1:49 p.m. In doing a little research, there is a piece of going wholesale on taxes for motor fuels that may not be apparent to some people. Some organizations don't ever retail or pay retail for fuel in the state, so by moving to a wholesale tax, they end up paying too. This in my mind helps level the playing field so that all motorists pay the same amount for use of the roads.